By plane: Airports in Osaka, Kobe, Okayama, Hiroshima, Yamaguchi-Ube, Takamatsu, Matsuyama, Oita. Except for Matsuyama, Kobe and Osaka, it takes almost an hour to reach the city centre from the airports. The main international airport is Kansai International Airport south of Osaka, but some of the other airports have international flights too, mainly to nearby Asian countries. Early (online) reservation or traveling around your birthday will make charges much cheaper; check the English homepages of the main airlines, ANA and JAL. By train: Shinkansen trains run along the mainland (Honshu) coast of the Seto Inland Sea. If you have a Japan Railway (JR) Rail-pass, this is the most convenient mode of transport - if not, it is still convenient but expensive. The areas introduced on this homepage all center on a major Shinkansen or other JR railway station. Different types of Shinkansen trains stop at different stations. Nozomi and Railstar are the fastest, Kodama the slowest - they spend most of the time waiting at stations for the faster trains to pass by. Frustratingly, they cost the same for unreserved seats, but Nozomi can't be used with a rail-pass. You can also cross over to Shikoku by train from Okayama over the Seto Ohashi Bridge. By ship: Long-distance ferries connect Osaka/Kobe with Matsuyama (Shikoku) and Beppu / Oita (Kyushu) - a leisurely and cheap way to travel and take in the beauty of the landscape at the same time. By bus: Highway buses run between Osaka and most major cities in the area. By ship: Ferry and high-speed boat lines in the Seto Inland Sea area are a maze, as every island has several ports, many small companies share the market and there is almost no English information. 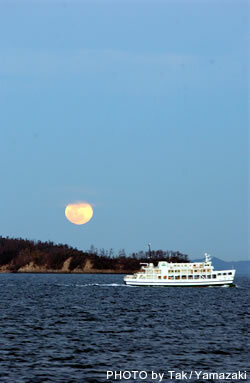 Easiest to use are the large ferries and high-speed boats that cross between Honshu and Shikoku, like the line connecting Hiroshima and Matsuyama. But don't be afraid of using the smaller lines to the islands, as they will give you a unique experience of the area - just allow extra time for checking twice and getting lost! 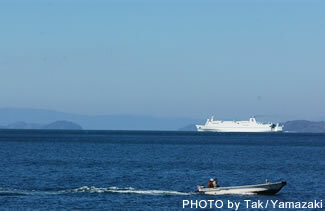 Ferries are very cheap and allow for cars and bicycles; high-speed boats can be expensive. 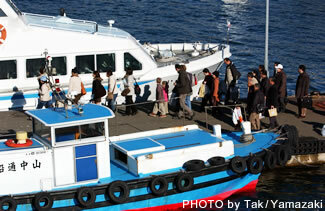 By water-taxi (Kaijo takushi ): If you travel in a group and want to move from one island to the next, sometimes water taxis are the fastest and not so expensive option. Ask at tourist offices or accommodation. By bus: Local bus lines are even more confusing than boats. In some cities, you will need a bus to reach the port from the station. Highway buses are convenient to cross the two bridge systems without train connection: from Kobe to Awajishima and further on to Tokushima on Shikoku, and from Fukuyama across the Shimanami Kaido to Imabari on Shikoku (see Mihara/Onomichi area). By streetcar: In Okayama, Hiroshima, Takamatsu and Matsuyama, streetcars are a cheap and easy way to move around. By bicycle: Many cities and islands offer bicycle rental. Especially on the islands, with little traffic and almost no public transport, this is a nice way to get around. Japanese traffic guide by Jorudan co.: gives you train and flight times, sometimes also buses and ferries. (c) 2006 YOKOSO! JAPAN All Rights Reserved.